The AHA/BHA Complex is to be used like a toner. It is an Alpha and Beta Hydroxy Acid blend that is alcohol-free. It is designed to remove dead skin cells, improve post-acne marks, de-clog and minimise the appearance of pores, re-balance the skin and to brighten. It is suitable for all skin types, but it is particularly great for oily/blemish-prone skin. It comes in a translucent bottle that holds 120ml of product. It has a spray cap to dispense the product which may be an annoyance to some who prefer press caps. I find this the best moment to add that within the package I received from Zenmed there was a spare push cap that fits the bottles. Therefore, if you do prefer a different type of cap, you can change it without issues. Moving on to application though, as explained above, this is to be used like a toner. You spray a small amount onto a cotton wool pad/ball and apply a thin layer to the face after cleansing and drying. You may encounter a small amount of tingling, and usage of a sunscreen post-use is highly recommended as AHA/BHA treatments leave your skin more susceptible to sun damage. On first use I actually felt that my skin was tingly and a little itchy, but it died down quickly. On second use my skin went a little red whilst it tingled (it was minor). On third and every subsequent use, my skin has been fine. At most there is a very mild tingling sensation but nothing uncomfortable. With that all said, even from the first use there were instant results. 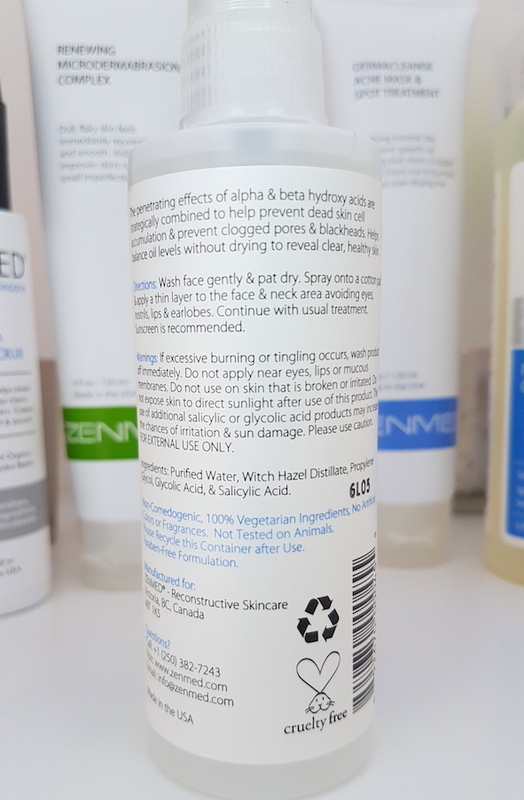 Most of the results I saw overall were thanks to using the combination of products, but this being one of the first items I tried I was able to see how it helped from the get go. My skin felt and looked less oily, was smoother and pores were less visible. As I've continued to use it, these results have just amplified and now my skin has a new brightness to it as well. As a chemical exfoliator, this is up there as one of the best I have used to date. It is a no fuss, no unnecessary extras, straight talking product that gets straight to work and excels at its job, and that is what makes me love it. 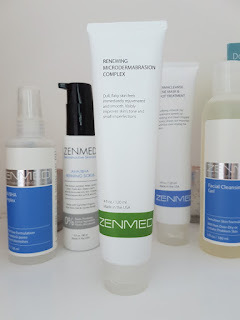 The Renewing Microdermabrasion Complex was an item that took me a moment to work out where about it should fit within my skincare routine. It is a a scrub that is houses within a clay formula that is packed with minerals and is designed to provide "intensive dermabrasion" on the skin. It is also described as being best used before the use of treatments as it allows the following products to absorb into the skin better. It also aims to reduce the visibility of scars, fine lines, oily skin conditions and uneven skin tone. 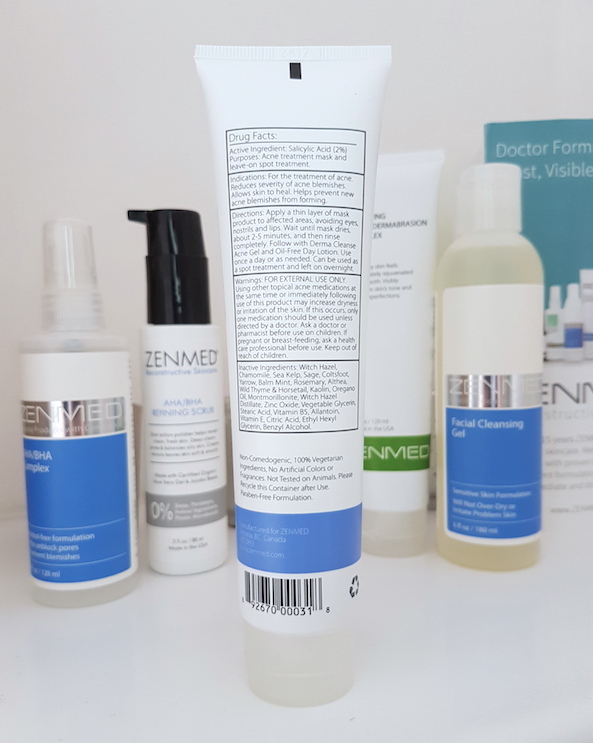 Zenmed recommend to use this after cleansing at night and whilst the skin is still wet, starting at only two nights per week. From here you can build up to five nights in a row, and then five nights without use, then five nights with and so on. Only a small amount is needed and you need to work in sections. Using upwards, circular movements, use your finger tips to massage the skin and work in small areas at a time for between 10-30 seconds. Once one area is finished, move to the next and continue. As with the AHA/BHA Complex, don't forget your sunscreen during the day time! The first thing that you may notice is that the consistency of this product is thick, so it may require a squeeze to get it out of the tube. Don't over-squeeze though as you don't need much of this. It's rather concentrated, so a small amount goes a really long way. Massaging this into the skin may take a while longer than your regular face scrub, but oh my, the results are so worth it. After the first use it left my skin feeling super soft and smooth and looking bright. Each time I've used it since the results have only gotten better and better. Also just like they promised, the rest of my skincare products now also work better and I see more results from everything else when this is within my routine. It's a fab little product, for sure. Another added bonus is that taking the time to use this just feels good. You get to give yourself a nice face massage and it all just feels so nice and relaxing whilst you're also giving your skin a treat. If you look at the instructions and wonder like I did where you're going to fit it in (I think this is more of an issue when you have far too many skincare items), just go for it and squeeze it in. It will be worth it and you will thank yourself. Out of all of the Zenmed items I received, this was the one I was most excited to try. At the time it arrived I had a bad breakout going on, so I was hoping that this would be my saving grace. The Derma Cleanse Acne Mask & Spot Treatment is another clay-based product that is designed to help heal spots and reduce excess oil on the skin. It also contains Salicylic Acid. It can be used as a quick face mask and also overnight as a spot treatment. After cleansing, dry the skin and apply a thin layer of the mask on problem areas of the skin. Just like the Microdermabrasion Complex, the formula is a little thick so the tube will need a squeeze. Once on the skin, let it dry and leave on for only 2-5 minutes (trust me, that's all you need) and then rinse thoroughly and follow up with the rest of your skincare routine. It can be used every day or just when needed. As soon as you apply it to the skin you can feel the cooling sensation that it has. You can also see that it dries very quickly. Even with it being on for such a short amount of time, you can see the oil being pulled out of your pores which is always oddly satisfying. The first time I used it, I lost track of time and admittedly left it on for longer than I needed to. It was about 10 minutes. I don't recommend leaving it on for this length of time as after removal my skin felt quite dry and dehydrated with that tightening and discomfort that comes with it. When used for a maximum of 5 minutes I haven't had this issue (but I have followed it up with a hydrating night cream just incase). Just like I hoped though, this did come to my rescue. 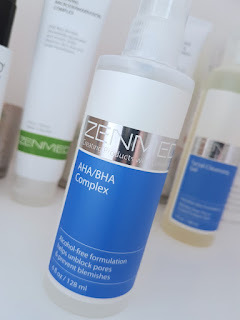 I found that this did help my blemishes to heal far faster (I did use it as a spot treatment to leave on overnight as well), and more noticeably it has been really helping to reduce the amount of excess oil on my skin. I'm not sure if this is needed for daily use for everyone, but I think that during a bad breakout it does help to use it every day. You should also be aware of using it with other types of acne products as to not cause over drying of the skin. If you have severely oily skin, this is a great product to try. 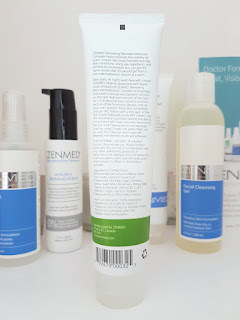 If you have oily, blemish-prone skin, I definitely recommend giving it a whirl. 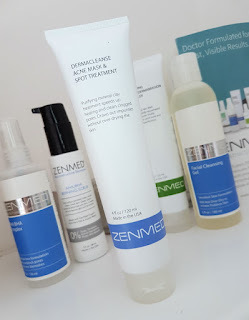 If you have dryer skin but still have blemishes, I would recommend it more as a spot treatment directly on blemishes rather than as a face mask as this could be far too drying otherwise. So final conclusions? 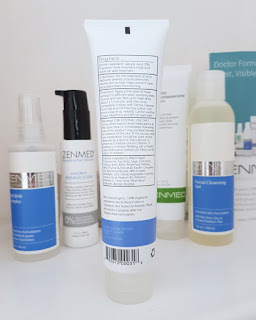 Let's just say that I was in the middle of a bad breakout when this collection of goodies arrived and so when I say I saw instant results with it, I'm talking any dryness around blemishes began to disappear, redness was heavily reduced and my skins oil level was decreased. Any post-blemish redness disappeared faster than usual and within a few days my skin was already looking far better. It was clearer, brighter, less oily and more even. I would imagine that the results would take longer depending on the severity of your issues, but perseverance with this collection and using them in conjunction with each other could be a route to victory. The downside though? Whilst individually each of these items are reasonably priced for how well they work (mid-range prices), they do work better when used alongside the rest of the products in the range and therefore the total price will be the addition of all of those mid-range prices. Do you need to buy all of the items? It depends. If your problems are mild, you could get results from only one or two items, but if you are struggling to help heal bad, acne prone skin, you will likely need to use more of them together at once to get the results. I am saying this when taking into consideration that there are more items to be reviewed from what I have been using, so whilst I have spoken about three products in detail today, there are another two to come and there are still many more products to check out and use in conjunction with them too. Do I recommend them? Absolutely. I find that these items are powerful and actually provide you with the results that you want from your skincare. So many brands talk the talk when it comes to healing blemish-prone skin, but it's only a few that can fully walk the walk, and this is one of those brands that do help. 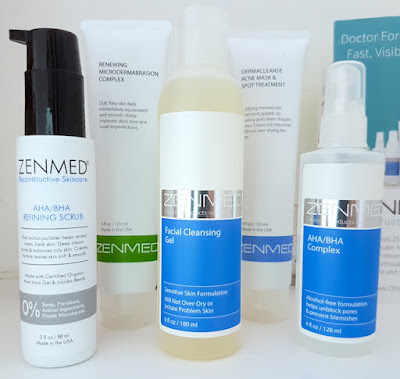 If you are in the USA you can purchase the range from Zenmed (you can also purchase from around the world but do take into consideration any customs charges). If you are in the UK I did find a stockist online, Dermacare Direct. What are your thoughts on the Zenmed AHA/BHA Complex, Renewing Microdermabrasion Complex and Derma Cleanse Acne Mask & Spot Treatment?